For most of us, keeping loved ones safe and secure is a paramount concern. Making sure doors and windows are locked when you are away will also help keep heirlooms, important keepsakes, and financial information safe as well. While many of us take these steps as the first line of defense, it’s important to remember the largest entrance of many homes – the garage door. Perhaps the easiest way to enter the garage is through the garage door remote. Many remotes are placed on the overhead visor in the front seat, often in plain view. Once the remote is obtained, an industrious thief will have gained full access. A small remote that fits on your keychain is one way to combat this and many manufacturers have that as an option. Some home stores even have keychain remotes you can buy to synch with your opener. While away from the home for an extended period, unplugging the the opener will keep the garage door closed until you return. Or, if the garage doesn’t have an opener, padlocking the latch will prevent the door from opening as well, even if a burglar has gained entry into the garage. It will take a few more minutes to get the door to open on your return, but it’s time well spent. 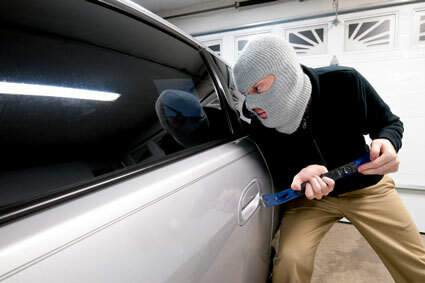 Burglars will sometimes bypass the garage door entirely, looking for unlocked windows or exterior doors to get inside. A few well-placed bars on the inside of a window won’t prevent the window from being broken but will keep unwanted guests outside. Reinforcing a service door with longer screws in the door jamb will deter most other burglars as well. Make sure to reinforce any doors that lead to the house from the garage as well. Other steps, such as installing motion detector lights or obscuring any glass panels in the garage door will shine a light on any potential thieves and will prevent them from seeing what you have in your garage. Additionally, keeping the garage door closed when not in use will help keep the contents of your garage private. Keeping your life safe and secure doesn’t have to stop at the house – make sure your garage is equally protected. Contact Performance Building Products for more information on securing garage doors.